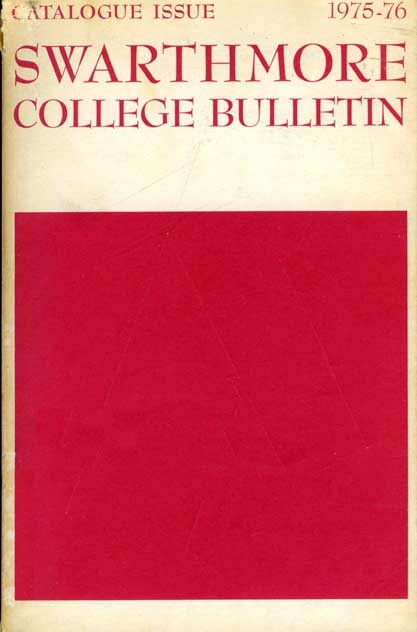 From the 1975–1976 Swarthmore College Bulletin (Catalogue Issue). Swarthmore College, founded in 1864 by members of the Religious Society of Friends, is a co-educational college occupying a campus of about 300 acres of rolling wooded land in and adjacent to the borough of Swarthmore in Delaware County, Pennsylvania. It is a small college by deliberate policy. Its present enrollment is about 1200 students, of whom 550 are women and 650 are men. The borough of Swarthmore is a residential suburb within half an hour's commuting distance of Philadelphia. Because of its location, Swarthmore College students are able to combine the advantages of a semi-rural setting with the opportunities offered by Philadelphia. Especially valuable is the cooperation made possible with three other nearby institutions, Bryn Mawr and Haverford Colleges and the University of Pennsylvania. In accordance with the College's Quaker tradition, Swarthmore students are expected to prepare themselves for full, balanced lives as individuals and as responsible citizens through exacting intellectual study supplemented by a varied program of sports and other extracurricular activities. The purpose of Swarthmore College is to make its students more valuable human beings and more useful members of society. It shares this purpose with other educational institutions, for American education is a direct outgrowth of our democratic principles. While a common purpose underlies all American education, each school and college and university seeks to realize that purpose in its own way. Each must select those tasks it can do best. Only by such selection can it contribute to the diversity and richness of educational opportunity which is part of the American heritage and the American strength. Democracy demands a broad base of intelligent understanding of issues. It also necessitates a high order of excellence in those who are destined to become its leaders. Swarthmore can best serve society by the maintenance of high standards. It is peculiarly fitted by tradition and performance for this essential role, and it is precisely this readiness to do a particular job well that gives the College its value in the educational pattern of American democracy. Education is largely an individual matter, for no two students are exactly alike. Some need detailed help, while others profit from considerable freedom. The program of Honors study, in which Swarthmore pioneered, is designed to give recognition to this fact. It is the most distinctive feature of the College's educational program. For many students, it provides an enriching and exciting intellectual experience. It has as its main ingredients freedom from ordinary classroom routine, close association with faculty members in small seminars, concentrated work in broad fields of study and maximum latitude for the development of individual responsibility. The Honors program and the Course program are alternative systems of instruction for students during their last two years. Both are designed to evoke the maximum effort and development from each student, the choice of method being determined by individual need and capacity. Swarthmore College was founded by members of the Religious Society of Friends, and it seeks to illuminate the life of its students with the spiritual principles of that Society. Although it has been non-sectarian in control since the beginning of the present century, and although the children of Friends compose a minority of the student body, the College seeks to preserve the religious traditions out of which it sprang. The essence of Quakerism is the individual's responsibility for seeking truth and for applying whatever truth he believes he has found. As a way of life, it emphasizes hard work, simple living, and generous giving; personal integrity, social justice, and the peaceful settlement of disputes. The College does not seek to impose on its students this Quaker view of life, or any other specific set of convictions about the nature of things and the duty of man. It does, however, have the two-fold aim of encouraging conscious concern about such questions and unceasing re-examination of any view which may be held regarding them. That is the kind of ethical and religious character which Swarthmore seeks to develop. A college is never static. Its purposes and policies are always changing to meet new demands and new conditions. The founders of Swarthmore would find in it today many features which they never contemplated when they shaped the College in the middle of the nineteenth century. Swarthmore, if it is to remain effective, must be forever changing. The goal is to achieve for each generation, by means appropriate to the times, that unique contribution and that standard of excellence which have been the guiding ideals of Swarthmore from its founding. The primary educational resources of any college are the quality of its faculty and the spirit of the institution. Second to these are the physical facilities, in particular the libraries, laboratories and equipment. Laboratories, well equipped for undergraduate instruction and in some cases for research, exist in physics, chemistry, zoology, botany, psychology, astronomy, and in civil, mechanical and electrical engineering. The Sproul Observatory, with its 24-inch visual refracting telescope, is the center of much fundamental research in multiple star systems. The Edward Martin Biological Laboratory provides facilities for work in psychology, zoology, botany, and pre-medical studies. The Pierre S. du Pont Science Building, completed in 1960, provides accommodations for chemistry, mathematics, and physics. Beardsley and Hicks Halls contain the engineering laboratories. The Arts Center, opened in 1961, contains the Paul M. Pearson Experimental Theater, the Rorence Wilcox Lobby for art exhibitions, and studios for various arts and crafts. The Lang Music Building, opened in September 1973, contains an auditorium seating approximately 500, the music library, classrooms, practice and rehearsal rooms, and an exhibition area. It is the central facility for the program of the Music Department and for musical activities at the College. The Computer Center, located in Beardsley Hall, is furnished with an IBM 1130 computer with a plotter and appropriate supporting equipment. Students and faculty members also have access to IBM System 370 facilities using telecommunication equipment for remote job entry. Both systems are available to students and faculty members for research and instruction. The Center for Social and Policy Studies in Beardsley Hall, established in 1972 under an initial grant from the National Science Foundation and closely related to the Computer Center, is a facility for thc accumulation of data and for student and faculty research projects, which are frequently interdisciplinary and part of the curriculum. It is intended to encourage interaction and a common focus among departments, especially the social and natural sciences, engineering, and mathematics, in empirical work on social and policy issues. The Language Laboratory in Beardsley Hall, made possible by a contribution from the James Foundation of New York, was installed in 1964. It provides stations for 24 students and has the equipment for effective use in language teaching. The Bartol Research Foundation of the Franklin Institute, which is also located on the campus, enjoys an international reputation for its basic research activities in physics, particularly in the fields of nuclear physics, cosmic radiation, solid state physics, and astronomy. Through its affiliation with Thomas Jefferson University, Bartol offers a program of study leading to the Ph.D. degree. The Thomas B. and Jeannette E. L. McCabe Library contains reading rooms, offices and the major portion of the College library collection. Total College library holdings amount to 400,000 volumes. Some 20,000 volumes are added annually. About 2,000 periodicals are received regularly. The general collection, including all but the scientific and technical books and journals, is housed in the library building, situated on the front campus. The Du Pont Science Library houses some 23,500 books and journals in chemistry, engineering, mathematics and physics. The Lang Music Library contains about 9,000 books and scores, 4,000 recordings, and listening equipment. The library is definitely a collection of books and journals for undergraduate use. The demands of Honors work, however, make necessary the provision of large quantities of source material not usually found in collections maintained for undergraduates. It is a point of library policy to try to supply, either by purchase or through inter-library loan, the books needed by students or members of the faculty for their individual research.